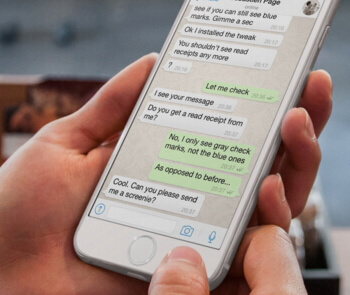 WhatsApp has changed the way people communicate with their family and friends. It is a free-to-use messaging platform that allows its users to send and receive text messages, audio, video files, location and contacts. Due to unforeseen circumstances, you might lose the WhatsApp data of your phone. In this situation, you search whether any WhatsApp data recovery app is available to recover the lost data on iPhone. With so many software and apps available in the market, it is tough to choose the right one. How to Choose the Best WhatsApp Data Recovery App for iPhone? When you choose the WhatsApp data recovery tool for your iPhone, you need to make sure that it is secure and gets the job done as required. Let’s see some other things that you need to consider before choosing the WhatsApp data recovery app. The data recovery tool must be compatible with all iPhone running on any iOS version. It should be able to recover WhatsApp messages and attachments. Some will only recover the lost chats of WhatsApp and not the attachments. So, check whether it supports both of them. The software should be free from any kind of virus and should not corrupt the existing data. Make sure that the WhatsApp data recovery app has a high recovery rate. 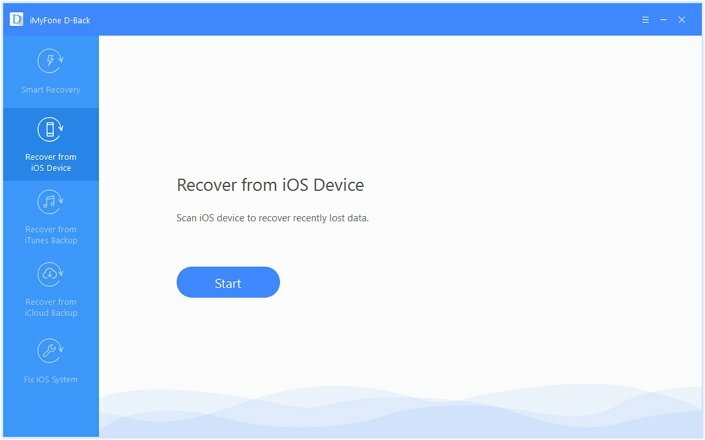 This means that you can recover most of the lost data of your iPhone. When you lose any data, you may search for a reliable WhatsApp data recovery app for iPhone. 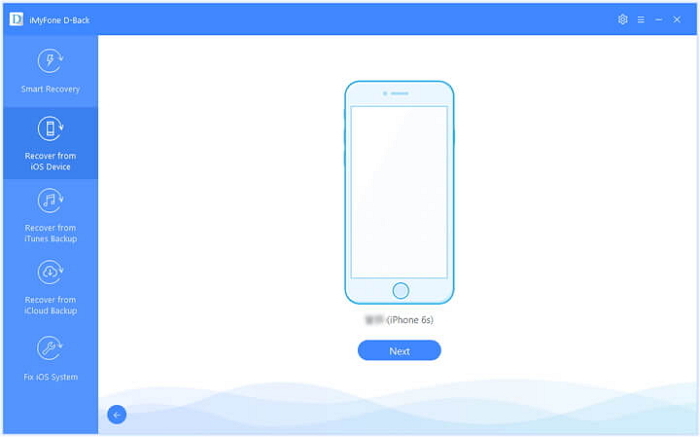 But due to restrictions from Apple, you can only find the desktop software for recovering the lost data of your iPhone instead of applications on iPhone device. iMyFone D-Back is one of the most trustworthy and secure data recovery tools for recovering the lost data of your iPhone. It can recover almost all the data types from the device without any problems. It is compatible with all the devices including iPhone XS Max/XS/XR and all the iOS versions. This data recovery tool allows you to recover the lost data using various modes. 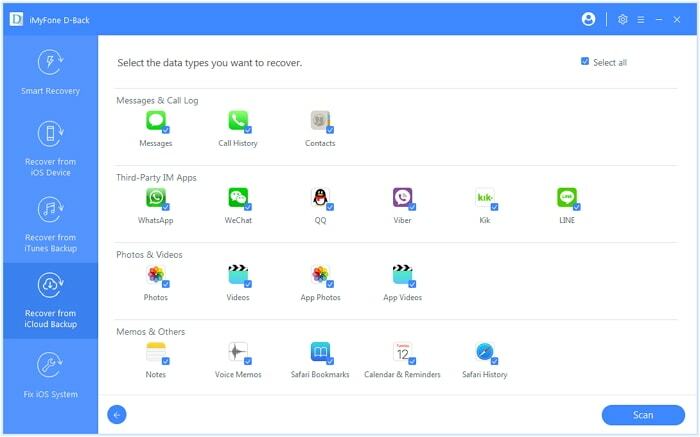 It can selectively or fully recover WhatsApp data from any iOS devices. It can recover WhatsApp data without restoring. It can recover WhatsApp data without affecting your current data. It can recover WhatsApp data without affecting your previous backups. It can recover WhatsApp data with no storage limitation. It can recover 18+ data types such as contacts, messages, call history etc. It can recover WhatsApp data from all the iOS devices and iOS backups. Step 1.Open D-Back data recovery tool and select “Recover from iOS Device”. Click “Start”. Step 2.Connect the device to computer. Once connected, the software will automatically detect the phone. Click “Next”. Step 3.All types of files that can be recovered will be displayed. Select “WhatsApp” under Third Party IM App and click “Scan”. Step 4.When it finishes scanning the data, all the WhatsApp data will be neatly shown. Select the conversations and attachments that you want to recover and click “Recover”. It will ask you to select the location to store the recovered WhatsApp chats and attachments. Once it is done, the recovery process will begin. Step 1.Open D-Back and select “Recover from iTunes”. Click “Start”. Step 2.All iTunes backups will be displayed. Choose the most relevant one for recovering the WhatsApp from and click “Next”. Step 3.All data types will be displayed. Select “WhatsApp” under Third Party IM App and click “Scan”. Step 4.All the WhatsApp data will be shown when the scan is completed. 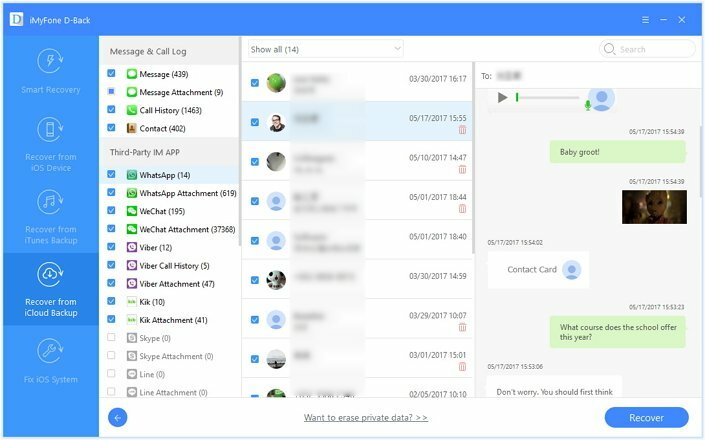 Select the conversations and attachments you want to recover and click “Recover”. Choose the existing folder or create a new one to store the recovered WhatsApp chats and attachments. The WhatsApp data will be recovered when the recovery process is finished. Step 2.Sign in to your iCloud account using Apple ID and password. 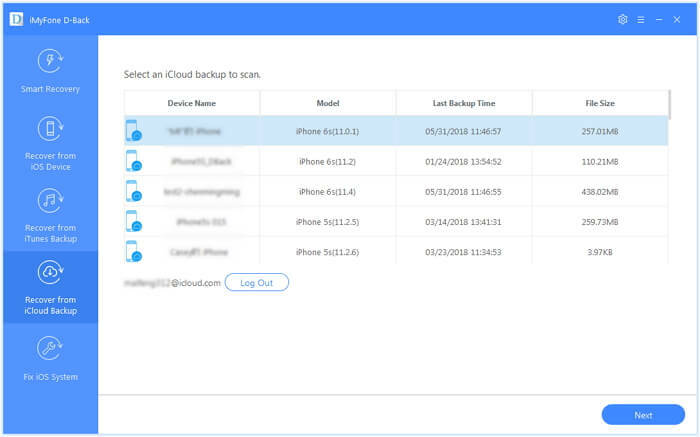 Step 3.All the iCloud backups will be shown. Select the most relevant backup and click “Next”. Step 4.All recoverable data types will be shown in the next screen. Select “WhatsApp” under Third Party IM App and click “Scan”. Step 5.All the WhatsApp data that can be recovered will be shown when the scan is completed. Select the conversations and attachments you need and click “Recover”. Choose an appropriate location to store the WhatsApp data. 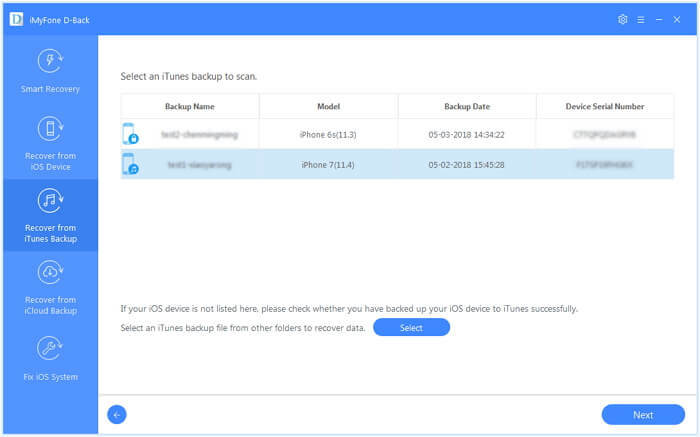 Apple allows you to make a backup of your iPhone’s data using iTunes and iCloud. 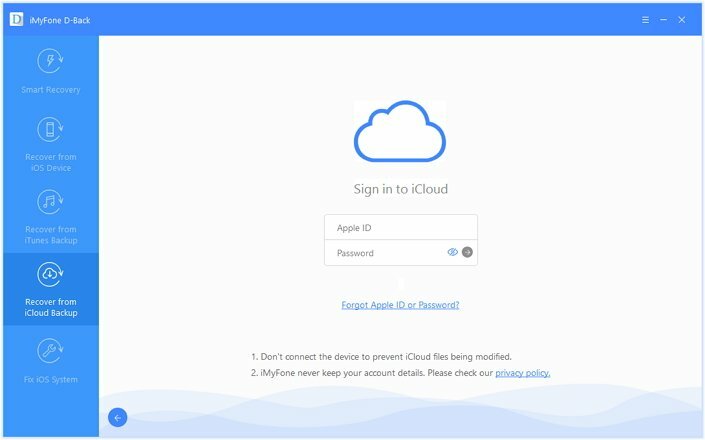 When you lose any data, you can restore them from official iCloud or iTunes backup, but all the existing data of your device would be lost. iMyFone D-Back is a secure data recovery software and can conveniently recover the data using any of the four modes. With the highest data recovery rate, it can recover most of the deleted data in a short period of time. Even if you don't have a backup, this recovery tool may recover the data from your device. You also don't have to recover the entire data of your device. You can only select the type of data you need and recover the particular data of your device. If you are looking for the best WhatsApp data recovery app for iPhone, then you should definitely try iMyFone D-Back data recovery software. Leave your comments below if you need more information regarding this advanced data recovery software.